Dishonored: Death of the Outsider is an expansion, an experiment, and a conclusion. Series director Harvey Smith told me about the standalone game, which takes place months after the end of Dishonored 2, at QuakeCon 2017. It's coming out on its own rather than as DLC for Dishonored 2, but that doesn't mean it will stray from the grand tale of betrayal and redemption at the heart of the series. 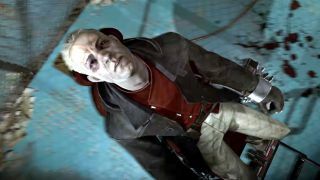 "First of all, this feels like some kind of finale to the arc of the Dishonored games that relate to the political assassination of Jessamine Kaldwin," Smith says. "Corvo [protagonist of Dishonored] was standing there, her bodyguard and lover, while it happened. Emily [co-protagonist of Dishonored 2], her daughter, was standing there. Daud [protagonist of Dishonored's DLC expansions] was there because he pushed the knife in. And Billie Lurk [protagonist of Death of the Outsider] was there because she was part of the crew that assassinated Jessamine." "I don't actually know yet what I'm going to be working on [after Death of the Outsider]. And I don't know whether there will be additional Dishonored games. But certainly for this arc related to the Rat Plague and Jessamine and those characters, this is definitely a finale, it feels like," Smith tells me, relishing this rare opportunity to give a big-budget story a satisfying conclusion. "There may be something new that we do or not, I don't know. But for this part... It feels like if we did something new we'd take a jump, you know." For a look at the other kinds of things Arkane Studios might do, check out our review of their first-person, sci-fi adventure, Prey. And read our hands on preview of Dishonored: Death of the Outsider so you can start familiarizing yourself with the tools of the god-killing trade.